Amy Lee (EVANESCENCE) and Grammy nominees Dave Eggar and Chuck Palmer, in collaboration with former "Riverdance" stars and fellow Brooklyn artists Hammerstep, have composed an original song for a brand new short film that combines sci-fi, martial arts and neo-Irish dance. "Indigo Grey: The Passage" is a seven-minute audio-visual experience that recently premiered at the 2015 Los Angeles International Short Film Festival and has so far been officially selected to screen at 14 international film festivals. Written and produced by Hammerstep founders Garrett Coleman and Jason Oremus, "Indigo Grey: The Passage" was directed by award-winning, Brooklyn-based filmmaker Sean Robinson — who describes the short film as being about "taking risks and exploring the lines between fantasy and reality." "Indigo Grey: The Passage" was officially released online September 13 and can be seen below. The film is based on Hammerstep's "Indigo Grey" — a live, immersive show experience, set to open in New York City in 2016. Stay tuned to www.hammerstep.com for more details. 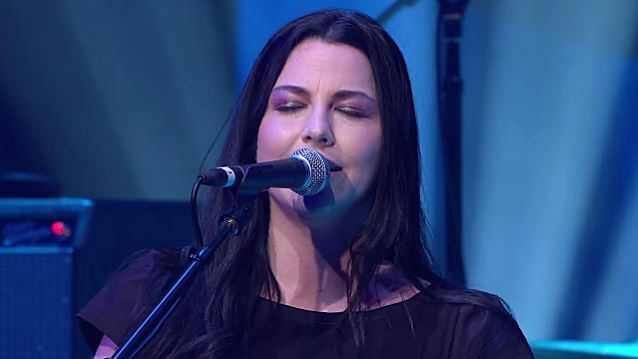 EVANESCENCE recently parted ways with guitarist Terry Balsamo and replaced him with Germany's Jen Majura.